I have an exciting post today! I was talking with the lovely Winnie of The RAWR Shop last week and we decided to do an emerald themed nail art day with a few other wonderful nail bloggers. Emerald was announced as the Pantone Color of The Year for 2013. Beautiful emerald hues will be popping up everywhere this year and I couldn't be happier- I love rich and verdant greens! I followed Kelly's tutorial pretty closely for the emerald stone nails. I applied the colours straight from their polish brushes using American Apparel Hunter, OPI Jade is the New Black, OPI Green-Wich Village, and black and white striping polishes. I did the outlines last using American Apparel Gold Flash and a striping brush. On the rest of the nails I used American Apparel Hassid. For the index finger I used a dotting tool and American Apparel Gold Flash to make the cross, topping each dot off with a green rhinestone. 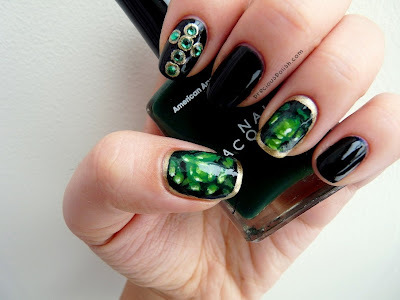 Head over to these talented ladies' blogs to see some more beautiful emerald manicures! Your gems look amazing! This is gorgeous! OMG I was about to do something like this last night but it was an EPIC fail!! haha this is so much better!